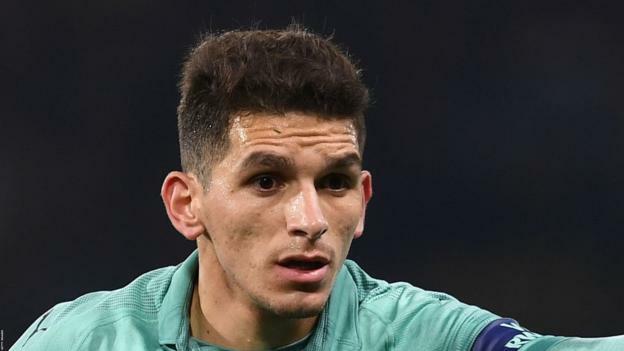 Midfielder Lucas Torreira has travelled with Arsenal for their Europa League quarter-final second leg at Napoli. The Uruguay international has been struggling with a groin injury and was substituted at half-time in the 1-0 win at Watford on Monday. Defender Sokratis Papastathopoulos may also return for the Gunners after being suspended at Watford. Napoli are likely to be without midfielder Amadou Diawara and Spain defender Raul Albiol. Manager Carlo Ancelotti says Napoli will need “a lot of heart” if they are to progress after losing 2-0 in the first leg at Emirates Stadium. The Serie A club have not won a European trophy since Diego Maradona inspired them to Uefa Cup victory in 1989. “I saw only a little courage in the early stages of the first game,” Ancelotti said. “Intelligence, I saw in both halves of the match. Heart is something we will put in tomorrow. We also need a significant dose of intensity. Napoli’s only previous home match against Arsenal was in the 2013-14 Champions League group stage, winning 2-0. Napoli have been eliminated on the past eight occasions they’ve lost the first leg of a major European knockout match, last overturning a first leg deficit in the 1988-89 UEFA Cup quarter-final against Juventus (0-2 first leg, 3-0 second leg). Arsenal’s last away match in Italy was at the last-16 stage of last season’s Europa League, winning 2-0 against AC Milan. Arsenal’s 2-0 win in the first leg was the 17th occasion the Gunners have won the first leg of a major European knockout match by two or more goals – they’ve progressed on each of the previous 16 occasions.